Runners leave the start line for the 2015 Run the Rockies 10K and Half Marathon, an annual event from Copper to Frisco on the Tenmile Canyon rec path. The event returns this year on June 4. From June through August, the Frisco Recreation Department is offering eight races on trails and recreational paths in and around Frisco. The summer kicks off with the 40th annual Run the Rockies 10K and Half Marathon on June 4. This early-season race begins by taking runners on a fast downhill course from Copper Mountain and through the Tenmile Canyon on the Summit County Recreational Path before eventually ending on Frisco’s Main Street. Both the 10k and half-marathon take place on June 4 and have long been recognized as the start of the Summit County racing season. The half-marathon is $60 and the 10K is $40 through June 3. Day-of registration is $65 for the half marathon and $45 for the 10K. Youth 17 years and younger get a $10 discount on the race fees. On June 18, racers have the opportunity to start their day at the 23rd Colorado BBQ Challenge with the Bacon Burner 6K. This 3.8-mile out-and-back run takes place on the paved Frisco Recreational Path, which weaves through town and along Tenmile Creek. All racers receive commemorative Bacon Burner apparel, and all registrants 21 years and older also get a free beer ticket to redeem at the barbecue event. This race is open to 400 racers and fills quickly because of well-stocked bacon aid stations, plus the opportunity to get a little exercise before indulging in delicious barbecue. The second annual Frisco Mountain Goat Kids Trail Running Series is held July 5, July 12, July 19 and July 26. This series of four kid-only trail running races is held each Tuesday in July, featuring three courses of varying distances. The courses are made for kids of all abilities, from those who just learned to walk to 15-year-old runners. The entire family is encouraged to come out to participate or simply cheer on these budding trail runners. The third annual Frisco Triathlon comes to the Frisco Bay Marina on July 16. This unique triathlon features a 3K stand-up paddleboard leg, a 15K mountain bike leg and a 5K trail run. The Frisco Triathlon was named “Best Triathlon” in the 2016 Elevation Outdoors Magazine reader poll. The funky twist on a traditional triathlon is open to all ability levels and encourages athletes to take on a new multi-sport event, with beautiful Dillon Reservoir and the Frisco Peninsula serving as the event location. The final race of the Frisco summer race season is the Run the Rockies Trail 10K and Half Marathon on Aug. 13. This race leads runners throughout the Frisco Peninsula on trails with breathtaking views of Dillon Reservoir, the Gore Range and the Tenmile Range. Over the past four decades the route has proven to be a great intro for first-time half marathoners, as well as seasoned runners. Registration and more information are available online at http://www.RuntheRockies.com. There are early-bird sign-up discounts for all of the races. 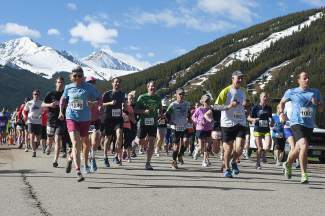 Race fees from the Run the Rockies Series benefits several Summit County nonprofits.